Alisanos, the deepwood, is more than just a forest...it is sentient, and predatory. Home to demons and worse, its mercurial boundaries can suddenly shift miles in any direction to encompass previously safe human lands - and those taken by the deepwood are forever changed. Audrun, a human woman trapped within the forest, is reunited with her four children, only to learn that each has been marked by the deepwood’s wild magic. And her newly born fifth child, captured by a winged demon, is still missing. Audrun has sworn to find the infant, but can a mere human possibly hope to outwit the monstrous inhabitants of Alisanos...and the nightmarish deepwood itself? 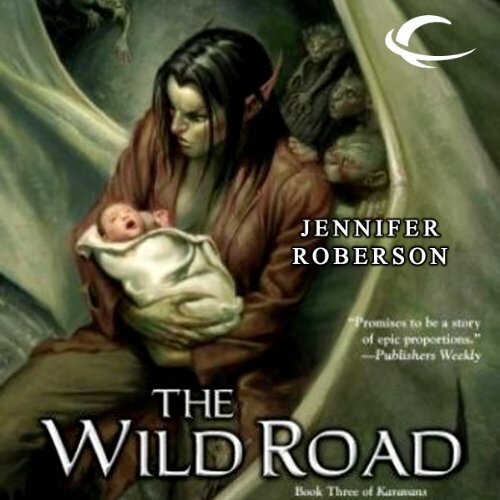 ©2006 Jennifer Roberson (P)2013 Audible, Inc.
Well, by book three you would think I would be used to the robotic reading by the narrator. But no, it still grates. Book is super slow, goes nowhere, leaves you hanging and 7 years later there is no fourth book. Ugh. This story line had so much potential. this series is not a trilogy. Geeze im so glad I didn't give up on this series after the first book which I thought was dull. Book 2 and book 3 or where things really get going and if you're a Jennifer Robeson fan you will not be dissapointed. While I understand the need for this book in the series, I feel as though more should have been accomplished. The last 10 minutes move the story so much more than the rest of the novel. (This coming from someone who has read all of this and her two other series). I also found some of the repetition very distracting from the story. I tired of hearing how "she had an accelerated birth". (Which to me would be more preferable to an over-extended birth). Just letting the reader know that she was exhausted was plenty of detail after the first mention. I hate writing a poor review, because I always LOVE Jennifer Roberson books. This one just didn't hit here usual standard. I am hoping for the next book so that we can actually find out more of what is to happen. This one just felt like a place holder between book 2 and 4. The reader for this book read so poorly that maybe that influenced some of my frustration with the story. She is stilted and uses a staccato for each word. Each character lacks their own voice or tone. And poor farmer, why?, did he have to sound like a hick? Not at all the voice I have always imagined for him. Very very disappointed. Hoping the next in this series is so much better and we actually move in the plot.